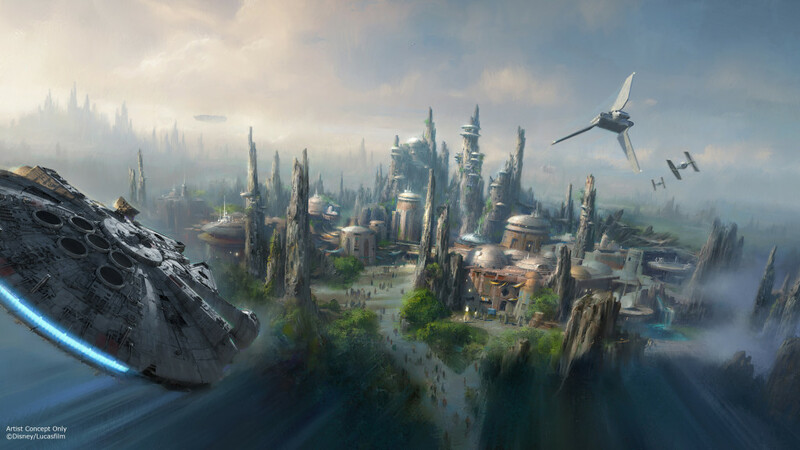 Some cool new details have come out today for Disneyland and Walt Disney World’s “Star Wars: Galaxy’s Edge,” and none cooler than the news that John Williams has composed a new theme specifically for the “Star Wars” themed land. StarWars.com has the news from D23’s Destination D: Celebrating Mickey Mouse even held at Walt Disney World today, where chairman of Disney Parks Bob Chapek announced the new theme by John Williams, and revealed a cool new video that showcases the new them along with footage of the park coming along in it’s construction, which you can check out in the video above. Along with that video, two other new short videos were revealed that showcase the two new attractions that will be featured in “Star Wars: Galaxy’s Edge,” and finally reveal the names those attractions that we previously just known to be the Millennium Falcon ride, and the battle with the First Order ride. Everything about “Star Wars: Galaxy’s Edge” is coming together nicely and looking really cool. But I just love the fact that John Williams is composing new “Star Wars” music even for them parks!